Army Sergeant Jorge Sepulveda joined the military in 2004, at the Military Entrance Processing Station in San Juan, Puerto Rico, citing a moral and patriotic obligation to defend the country. He felt he had to do his part to help build a better future for his family and fellow Americans, and wanted to start a tradition of military service in his family. Sgt. 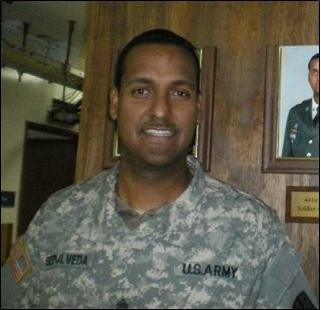 Sepulveda served in the Army for nine years. He served the country during Operation Enduring Freedom with the 1st Special Forces Group (Airborne) and the 10th Special Forces Group (Airborne). Among Sgt. Sepulveda's injuries and illnesses are chronic contact dermatitis, a fracture of the sacrum, chronic lower back pain, obstructive sleep apnea, skin fissures (internal), adjustment disorder, degenerative joint disease (ankle), and chronic pain to his wrists, elbows, knees, and groin. He has a 100% disability rating. Among the commendations awarded to Sgt. Sepulveda were the Army Commendation Medal (2x), Army Good Conduct Medal (2x), National Defense Service Medal, Global War on Terrorism Service Medal, Non-Commissioned Officer Professional Development Ribbon (2x), Army Service Ribbon, Overseas Service Ribbon (2x), Parachutist Badge, and the Certificate of Achievement (4x). Sgt. Sepulveda, his wife Bernice, and their three children were gifted a home in Apollo Beach, Florida in April of 2015.